The Army of the Republic of Cyprus was founded immediately after the Declaration of Independence. It consisted of 2000 men, 60% of whom were Greek Cypriots and 40% Turkish Cypriots. National service was not mandatory and could be imposed with the mutual agreement of the President (Greek Cypriot) and the Vice-President (Turkish Cypriot) of the Republic. After the intercommunal events of December 1963-64, the Turkish Cypriots departed from the official Army of the Republic. At the same time and because of the threats of Turkey to take military action, the High Military Command for the Defense of Cyprus was created and a Greek Division was transferred to Cyprus. This Division operated on the island up to the end of 1967, when it was removed from Cyprus. In 1963, the Special Joint Staff of Cyprus was also established, and later was renamed into National Guard General Staff in 1964 after the establishment of the National Guard. Establishment of the National Guard - In June 1964, the Cyprus Parliament passed the National Guard Law, establishing obligatory national service and thus setting the foundations for the establishment of the active Cyprus Army. The military duty was initially 18 months and the National Guard was staffed by Officers, who assumed the responsibility of organizing and training its personnel with the help of volunteers who had joined the Army in 1962 and 1963. National Guard Battle Units (Mechanized and non-mechanized). Support Units and Service Units. Between 15 June 1964 and 2 August 1965, on the basis of the National Guard Law, a successive obligatory drafting of conscripts of the 1959-65 classes took place, resulting to the gradual development of the National Guard and the enlistment of about 17000 men. Since 1974 and up to the present, the National Guard, using modern technological advancements and staffed by well trained officers, graduates of Military Schools in Greece and other countries, has evolved into a considerable and battle-worthy deterrent force, with a high degree of training, operational readiness and fighting capability, comparable to those of European Armies. Beyond its specific military duties, the National Guard contributes to other activities and carries out social work, such as the assistance in fire-fighting, dealing with natural disasters and voluntary blood donation, while at the same time contributes towards the shaping and molding of the characters of the country's youth, during their military service. National Guard Emblem - The Two-headed Eagle was established as the emblem of the National Guard since its founding in 1964. It symbolizes the ecumenical character of the Greek spirit. The two-headed eagle was a mystical symbol of Hellenism since the ancient times. In ancient mythology, it was the par-excellence godly and heavenly bird, helper and protector of Zeus. It was first used as a symbol of power during the Byzantine years. It symbolized the dual sovereignty of the Byzantine Emperors in Europe and Asia. With its two heads looking proudly to the left and to the right, they wanted to indicate that the central power had its Reserve and Replenishment Units. Between 15 June 1964 and 2 August 1965, on the basis of the National Guard Law, a successive obligatory drafting of conscripts of the 1959-65 classes took place, resulting to the gradual development of the National Guard and the enlistment of about 17000 men. Since 1974 and up to the present, the National Guard, using modern technological advancements and staffed by well trained officers, graduates of Military Schools in Greece and other countries, has evolved into a considerable and battle-worthy deterrent force, with a high degree of training, operational readiness and fighting capability, comparable to those of European Armies. Beyond its specific military duties, the National Guard contributes to other activities and carries out social work, such as the assistance in fire-fighting, dealing with natural disasters and voluntary blood donation, while at the same time contributes towards the shaping and molding of the characters of the country's youth, during their military service attention equally focused towards the two worlds, east and west. As a Christian symbol, it is the official emblem of the Patriarchates throughout the Orthodox world. Enlistment Obligations - According to the National Guard Law, all male citizens of the Republic of Cyprus on the completion of their 18th year of age, as of the first of January of each year, and up to the age of 50, are under obligation to carry out national service. Duration of National Service - In 2003, by a decision of the Council of Ministers, national service was reduced from 26 to 25 months. or the Service of Prisons of the Republic. Those judged as unsuitable for medical reasons. The only or eldest son of a family who has a father or a brother killed or missing or died from wounds or privations or was wounded during his national service in the force, or while serving as a special officer, or when his family receives pension based on the Pension Fund and Extraordinary Benefits for Dependents of Persons Killed and Incapacitated Laws of 1962 to 1982. Disappeared or was killed or died from wounds or privations under extraordinary circumstances before the coup d' état of 15 Jul 1974 and whose dependents, consequently, receive an allowance from the Republic. Disappeared or was killed or died from wounds or privations during or after the coup d' état of 15 July or during the conditions caused by the Turkish Invasion of 20 July 1974 and who was identified by the Allowance Committee as “killed in action” or as “fully capacitated”, depending on the case. The prisoners of war who are considered as such by the Geneva Convention, as well as those held as hostages by the Turkish Invasion Forces, during or after the Turkish Invasion. All persons who, on the date that they are called for national service, have more than three dependents, as well as those persons who acquire the above specified number of dependents during their national service. Ministers, Members of the House of Parliament and Judges of any Court. The sons of a family in which both parents are deceased at the time of enlistment. Those who have dual nationality, being both Cypriot and Greek, given that during their permanent residence in Greece they have evidently completed (but not “bought” themselves out of the army service) the expected national service in the Greek National Forces. Special Exemption Cases - Those who belong to the Maronite, Armenian and Latin Communities are exempted from their service in the National Guard, unless they declare that they wish to enlist in the National Guard (Voluntary Enlistment). Firstborn or second born son of a family that, during the day of enlistment, has five or more male children alive. Eldest or only son of a family with 5 children out of whom four are minors and not married. The two eldest sons of a family with 6 or 7 children, out of whom four are minors and not married. The 3 eldest, 4 eldest, 5 eldest, 6 eldest, 7 eldest sons of a family with 8 or 9, 10 11, 12 13, 14 and 15, 16 and 17 children respectively, out of whom 4 are minors and not married. The duration of service is reduced by 4 months for conscripts of whom one of their parents is not alive. The conscripts who are children of persons identified by competent Committees as “killed”, “victims”, “disappeared” or “fully incapacitated”. The eldest sons of persons identified by the Allowance Committee as “incapacitated” during the wars for the Preservation of Independence, with percentage of disability over 49%. From the Maternal Side The service of citizens of the Republic whose father is not a Cypriot citizen and who are not persons of Cypriot origin through male descent is reduced to 6 months, as long as: They were born in Cyprus or any foreign country between 16 August 1960 and 1 June 1999. Voluntarily and after submitting an application, they have registered and become citizens of the Republic, based on the article 4(3) of the Law for the Citizens of the Republic of Cyprus of 1967 to 2002, because at the year of their birth their mother was or was allowed to become a citizen of the Republic of Cyprus. Repatriated Emigrants The national service is reduced for those persons, who were born or emigrated with their families abroad, for a time interval of over 10 years and have returned to Cyprus for final residence, depending on their age at the time of their arrival, i.e. Persons aged 10 to 13 years on their return to Cyprus will serve for 18 months. Persons aged 13 to 18 years on their return to Cyprus will serve for 12 months. Persons aged 18 to 25 years on their return to Cyprus will serve for 6 months. Persons aged 26 to 49 years on their return to Cyprus, will serve for 3 months. Enlistment of Conscripts - The enlistment of conscripts is initiated by a decision of the Council of Ministers and is implemented in two intakes in the months of January and July of each year. The first forty (40) days of disciplinary sentences (which translate into additional days of service) are waved. In cases of special circumstances the Minister of Defense has the power to reduce completely or in part the duration of disciplinary sentence to be served when it exceeds 100 days (for example for a total of 150 days of disciplinary remand, the conscript shall not serve the initial 40 days, shall definitely serve the other 60, whereas the remaining 50 days can be reduced via a decision by the Minister of Defense). 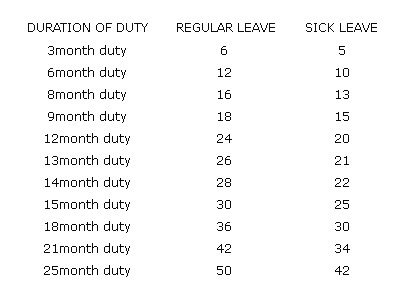 Leave of Absence - During national service, the conscript is entitled to regular leave and sick-leave, as detailed on the table below. Additional Leave of Absence - Additional leave of absence up to 60 days may be given to conscripts serving in the National Guard when participating in official international knowledge competitions or official international sports events. Discharge Due to Special Circumstances - The Minister of Defense has the power to discharge conscripts, by age-group or part thereof, by region or category, or in special cases, person by person, following their application, for reasons of special circumstances (such as family, social and economic reasons). Participation of Women in the National Guard - Women Officers and Non-Commissioned Officers (NCOs) serve in the National Guard. Officers are either graduates of High Military Educational Institutions in Greece or directly appointed by the Council of Ministers. NCOs can be distinguished into career and volunteer personnel. Career NCOs are either graduates of Military Schools of Non-Commissioned Officers in Greece or come from volunteer NCOs who are given permanent status after serving in the National Guard for at least six years. Women can enroll in all Schools and Faculties of Military Academies and colleges without any limits in the number of positions. The enlistment of women in the National Guard on a voluntary basis as NCOs began in 1990 and has continued up to the present time with great success. Their appointment takes place on contractual basis with an initial duration of three years, which can be renewed for subsequent three-year periods, provided this renewal is justified by the current needs. The Joint Defense Doctrine - In November 1993, the Prime Minister of Greece and the President of the Republic of Cyprus jointly declared “The Joint Defense Doctrine between Greece and Cyprus”. The implementation of this agreement seeks to enhance the Greek and Cypriot military capabilities in the whole of the joint defense area from Thrace to the Aegean Sea and Cyprus, so as to improve the Greek Defense against the Turkish expansionism and to create a powerful deterrent force. The declaration of the Joint Defense Doctrine between Greece and Cyprus aims to underline the commitment of Greece to consider as a cause of war (casus belli) any Turkish attempt to invade the unoccupied areas of Cyprus. Participation in International Organizations - United Nations - The Ministry of Foreign Affairs and the Ministry of Defense have decided a symbolic attendance of Cyprus in peace-keeping missions of the UN, by assigning two officers of the National Guard as representatives to the UN Stand-by Arrangements System (UNSAS) as staff officers and observers. OSCE - The Republic of Cyprus is a founding member of the Organization for Security and Cooperation in Europe (OSCE), from the date of its founding (1975). The Code of Conduct on Politico – Military Aspects of Security. The document on Global Exchange of Military Information. The OSCE decisions No. 14/1995 and 13/1997 on the Principles governing the Conventional Arms Transfers. The Vienna Document of 1999, on the Confidence and Security Building Measures. The OSCE document on small arms and light weapons. The questionnaire on anti-personnel landmines. The Convention on the prohibition of the development, production, stockpiling and use of chemical weapons and on their destruction. In the recent years, the Republic of Cyprus is actively involved in the OSCE, implementing an extravert policy and giving exposure to the National Guard. Thus, it fulfils its obligations towards the organization, including the submission of information within the deadlines and the active participation in military activities, conferences and seminars. The Republic of Cyprus has appointed an officer in the Permanent Delegation of the Republic in Vienna in order to follow all matters regarding the OSCE. European Union - The Republic of Cyprus declared its contribution to the EU capabilities on 21 November 2000, in Brussels, during the Defense Ministers informal meeting. The contribution of the Republic of Cyprus consists of a General Transport Company of 174 persons, one UAV system, the Air and Sea Surveillance System, the Search and Rescue Service, as well as facilities on the territory of Cyprus, such as ports, airports, hospitals, military facilities and target ranges. The Republic of Cyprus is represented in the Military Committee (EUMC) composed of the Chiefs of Defense of member-states, by the Chief of National Guard. Furthermore, a high-ranking officer has been appointed to the Permanent Delegation of the Republic of Cyprus in Brussels, who acts as the military representative (milrep) of the Chief of National Guard in the regular meetings of the Military Committee, in addition to his other duties. Cyprus has been given a position in the European Military Staff, which is in the process of being filled. At the same time, Cyprus participates in 5 of the 19 ECAP Project Groups, which deal with issues of covering the deficiencies of the European Military Capabilities. Western-European Union - In January 1998 Cyprus submitted its application to join the WEU as an associate partner. Open Skies Treaty - The Open Skies Treaty was signed in March 1992, by 25 OSCE member-states, not including Cyprus, and entered into force on 1 January 2002. On 30 May 2002, Cyprus submitted its application to join the Treaty, which was rejected because of Turkey's veto, despite the agreement of all the other member-states. The application of Cyprus remains on the agenda, because there was no unanimity for its rejection and the consultations will continue until a decision is taken at the appropriate time. The observer status deprives Cyprus of the capability of active involvement and benefits from the Treaty, such as receiving Aerial Pictures. For Cyprus participation as an observer, the invitation by another involved party is required. The Ottawa Treaty - On 17 January, 2003 the Republic of Cyprus affirmed the Ottawa Treaty, which calls for the gradual and complete abolishment of the anti-personnel mines as well as their destruction. The Treaty was initiated by the Republic of Cyprus on 1 July 2003 with the destruction of 4000 anti-personnel mines from National Guard stocks. Destruction of all stored anti-personnel mines by 1 July 2007. Removal and destruction of all mines in the existing mine-fields in the free areas, by 1 July 2013. Demeaning of the Buffer Zone - The Republic of Cyprus, taking into consideration the important international effort for the restriction of use and proliferation of mines, and in accordance with the policy of the United Nations in this field, decided to submit a proposal to the United Nations for the demeaning of the buffer zone which is controlled by UNFICYP, in the hope that the Turkish side will respond to this proposal in the same way. Even though the Turkish side was negative towards this proposal, the Republic of Cyprus unilaterally studied and discussed the practical aspects of clearing its mine-fields in the buffer zone with UNFICYP and in cooperation with the United Nations. In the framework of these discussions, a team of experts from the United Nations visited Cyprus in June 2002. Once it studied the whole spectrum of demining issues this team returned to New York to produce a United Nations corresponding study which will suggest ways in which it will be possible to implement Cyprus proposal. It is noted that since 1983, the Republic of Cyprus has cleared 10 minefields near the buffer zone and that during the last few years it has destroyed more than 11,000 mines of various types.